Oh Valentine’s Day, what a weird, twisted, and torturous holiday you are. I just don’t know how to handle you. On the one hand, you celebrate love, of all things. It’s kind of hard to hate that. I mean, who wouldn’t want to celebrate love? Well, besides Satan and all. He probably hates Valentine’s Day too. Your intention as a holiday, I’m sure, is good and true and kind. But on the flip side, your modern-day execution of Valentine’s Day: It’s the pits. It’s a giant cesspool of commercialism, competition, and insecurity. And I’m just talking about my Valentine’s Day feels here, people. The oddest thing about my jumbled emotions is that they don’t even touch the typical Valentine’s Day offenders. They have nothing to do with my relationship or my marriage. They’re not about passion or flowers or chocolate or diamonds, or even the lack thereof. Nope. They have everything to do with motherhood. Let’s face it; the pressure to be the perfect mom these days is always intense. We put a ton of emphasis on things that, 30 years ago when we were growing up, weren’t even on our parents’ radar. I can’t remember one parent, not one, bringing lunch to their child at school and sitting with them at the special visitor’s table. Do you want to know why? It wasn’t a thing. Our moms packed our lunches or pressed a crisp dollar bill into our hand and figured that we would get all the lunchtime nutrition we needed the good old-fashioned way, by trading everything with the kid whose parents packed peanut butter fluff sandwiches and snack packs. Man, I loved that kid. After school activities? Not a thing. We were either thrown outside to get into trouble with the neighborhood kids while mom watched the rest of her “shows,” or left to entertain ourselves with the likes of Disney’s DuckTales and Night Court re-runs. Which were awesome to my 8-year-old self, by the way. But nowhere has the pressure of mommy-hood knocked me more sideways than the H-E-double-hockey-stick that is known as the “Elementary School Valentine’s Exchange Party.” My heavens, how I hate the pressure of this day. 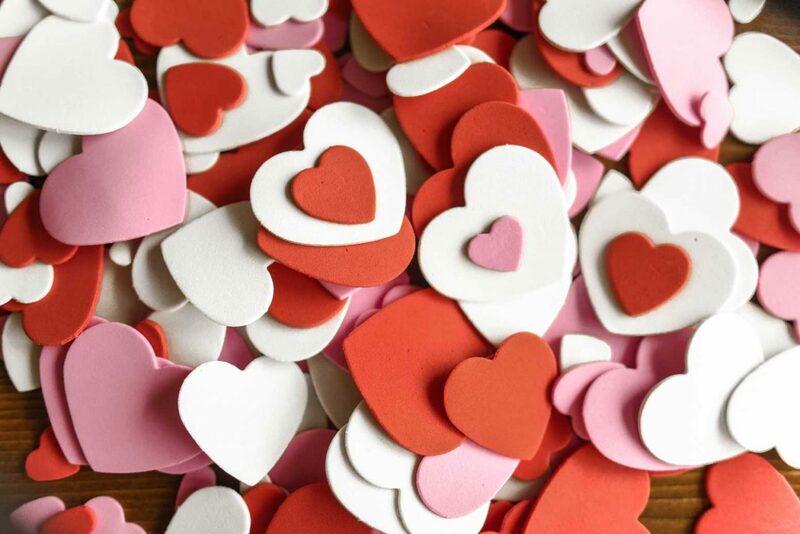 My heavens, how I hate the pressure of Valentine’s Day— not in my marriage, but in motherhood! Mainly I hate it because it hits on my weakness: crafts. I am just not crafty. I own this. At 40 years old I’ve made peace with it. I can’t sew, paint, or draw, and I have learned through many near disasters that a glue gun is not my friend. And if I’m completely honest, I don’t even want to do these things. They’re not my gifts, and they’re not my talents, and that’s OK — most of the time. You would think that this wouldn’t bother me because I am secure in my non-craftiness. Every year I want to do better. For this one day each year, I get a little bit insecure about my mommy-ness. I tell myself I won’t get caught up in it, but when I walk into that party, somehow there is always a side of me wishing I had tried just a bit harder and done just a bit more so the valentines my kids hand out look like they were made by a mom who cares. Because heaven forbid other mothers believe that I am just phoning it in in the parenting department. And we all know that parenting comes down to the snapshots other people see, right? Oh, wait. No. Just no. I refuse this year. I work hard every day to give my kids the best of me. To be the best mom that I can be. That is my Valentine’s Day gift to them. It’s not perfect handcrafted valentines they can give their friends. It’s not a holiday table with heart-shaped pancakes greeting them in the morning. It’s in the showing up. And, doing my best. And loving them–fiercely, recklessly, and with no borders. That’s my valentine to my children. I hope that’s what they remember as they get older. So, to all you moms out there just doing your best to give your kids the love that they deserve, this one’s for you. If you are a craft queen, who loves to glue googly eyes on 25 little valentines, hats off to you. If you decorate your house for every holiday and create memories of joy around it, you rock. If you do none of these things, not a one, but you give everything else you have to them and love them in a way that is true and authentic to you and your gifts—more power to you. Your kids will remember the love. Not the stuff. Unless that stuff is a peanut butter fluff sandwich. Everyone remembers those. To be the best mom that I can be. That is my Valentine’s Day gift to them.